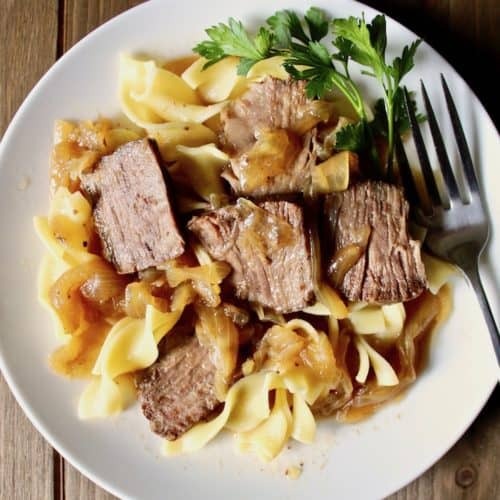 Beer-Braised Beef and Onions, a stripped down version of Carbonnades à la Flamande, a classic Flemish beef stew ~ essentially beef and onions braised in beer, preferably a Belgian Ale. This is what I like about the cold weather, dishes like this. 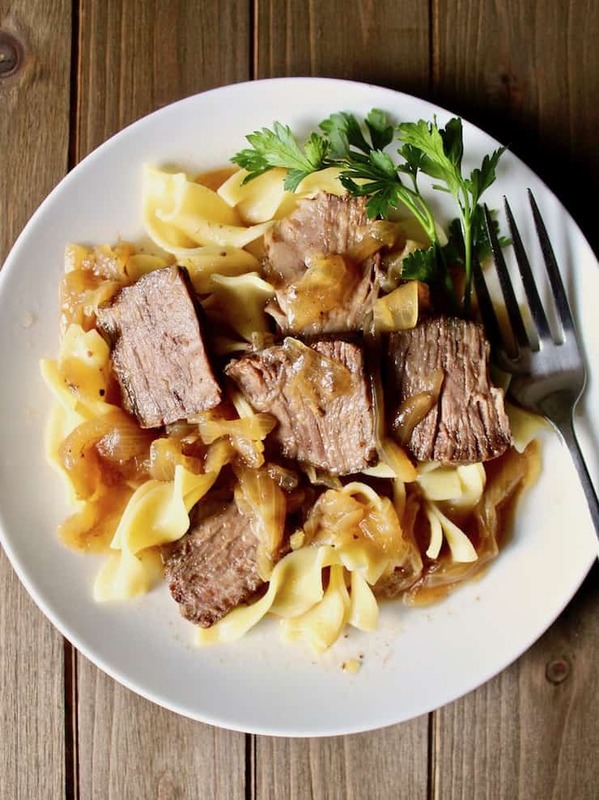 Beer-Braised Beef and Onions. So, so good, I can’t even tell you. I would say this is our favorite pot roast, hands down, and I have made a lot of pot roasts in my day. 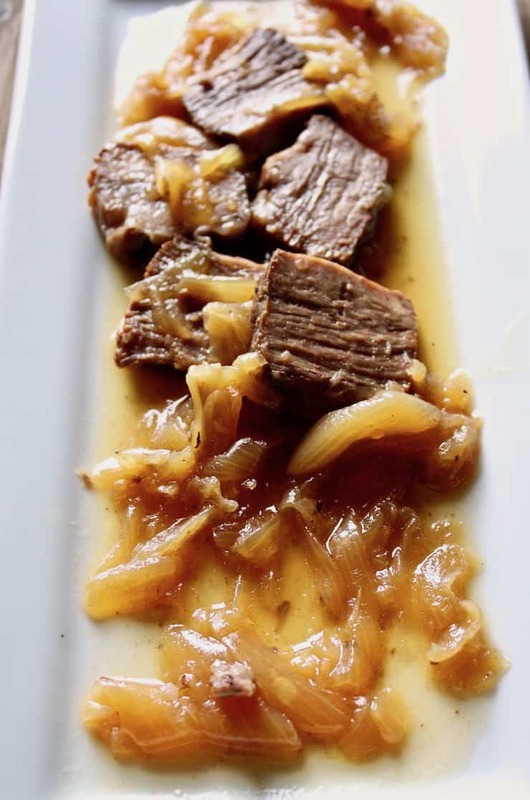 A beef chuck roast, braised in beer, a little vinegar and lots of onions. Delicious, my friends. There is a flemish stew called carbonnade, which is beef braised in beer with onions and other stuff. That is essentially what this dish is, stripped down a bit. What kind of beer to use? My recipe calls for a pilsner-style beer like Budweiser. Huh? I think maybe a Belgian Ale would be better, but we didn’t have any in the fridge. We like Hoegaarden and Blue Moon, and in the winter there’s usually some in there. So I used Schaffly White Lager, whatever that is. Meathead said it’s just a normal, light beer. Schaffly is a hometown brew here in St. Louis. You need a good size beef chuck roast that you tie to hold it together during the long braise, and so you can slice the meat in pieces instead of shredding it. Lots of onions, cut in half end to end and then sliced. It’s important to cut the onion end to end for slicing. The onions will hold their shape much better in this long braise, they won’t disintegrate into mush. Another favorite beef stew of mine is this easy pot roast with just three ingredients!! Make it in the oven, Instant Pot or slow cooker, the result is the same! 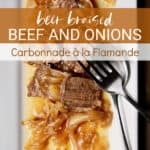 If you’ve tried this Beer-Braised Beef and Onions or any other recipe on the blog, then don’t forget to rate the recipe and let me know how yours turned out in the comments below ~ I love hearing from you! You can also FIND ME on FACEBOOK, TWITTER, INSTAGRAM and PINTEREST. Never miss a post ~ sign up for The Hungry Bluebird Newsletter for a weekly email of new content. 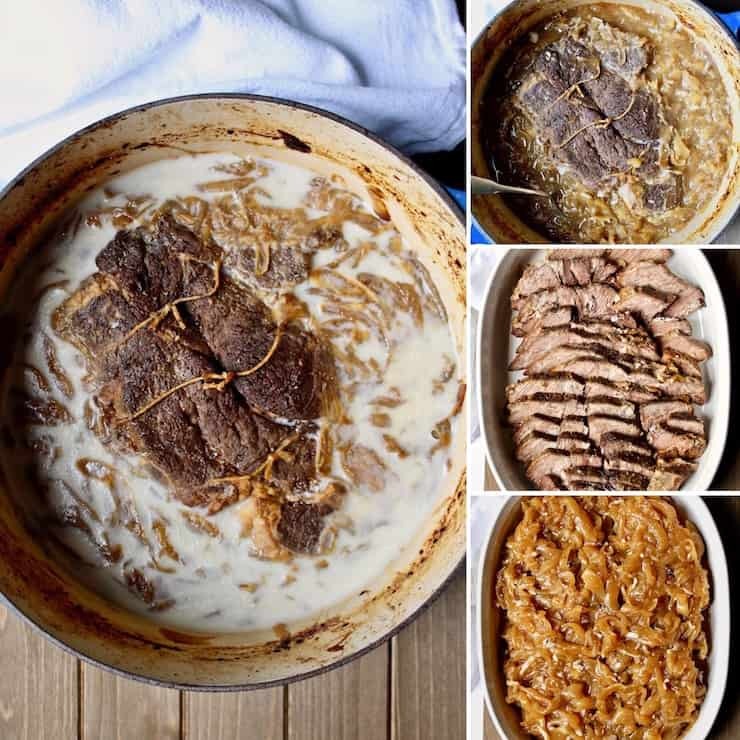 A stripped down version of Carbonnades à la Flamande, essentially beef and onions braised in beer, a classic Flemish beef stew ~ best made with a Belgian Ale. Halve and peel the onions lengthwise, then slice lengthwise (end to end) about ¼ inch thick. Pat beef dry and tie with kitchen string, about 1½ to 2 inch intervals. Generously season beef all over with kosher salt and 1 teaspoon of fresh cracked pepper. Heat 1 tablespoon oil in large heavy pot until it shimmers. Brown beef on all sides, about 15 minutes. Brown well, you want a good crust, not gray meat, this gives the dish tons of flavor. When done browning, transfer to a plate. Add remaining tablespoon oil to pot, then the onions and bay leaves. Add a generous sprinkle of salt and cook onions until well browned, scraping up any browned bits from bottom of pan and stirring occasionally, about 20 - 25 minutes. Watch closely, if bottom is getting too dark and starting to burn, deglaze and scrape up the fond with a splash of beer. That's what I did and then the bits came right up. After onions have browned, add the beer and vinegar to onions and bring to a boil. Again, stir and scrape up any browned bits. Add the beef and any accumulated juices and return to a boil. Cut a round of parchment paper the diameter of the inside of pot, I traced the lid and then cut out the round. Place parchment round on top of meat and onions. Cover, and braise in oven until meat is very tender, about 3 to 3½ hours. Transfer beef to cutting board and tent loosely with foil, let rest 20 minutes. Remove string and then slice meat. Skim fat off surface of sauce and onions and discard bay leaves. 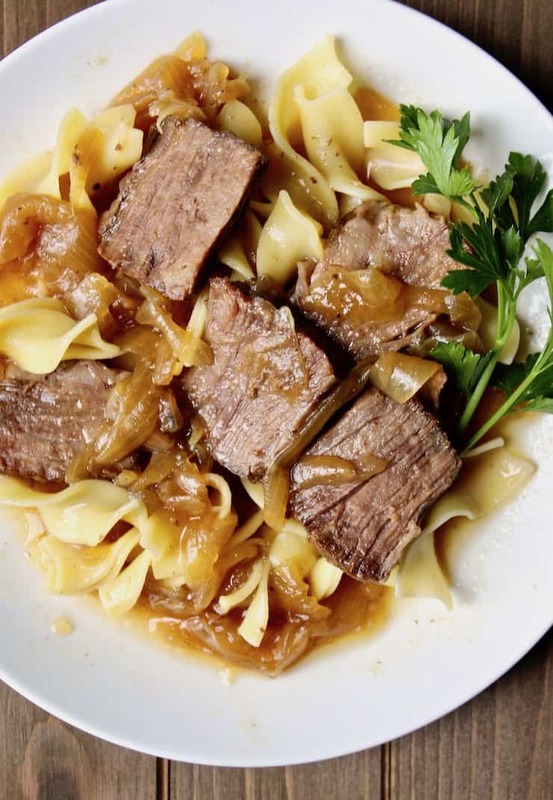 Serve braised beef with onions and sauce, and mashed potatoes or egg noodles. Alternately, make at least one day in advance, and when beef has cooled, chill in sauce in refrigerator overnight. Discard solidified fat (a little is okay, flavor!). 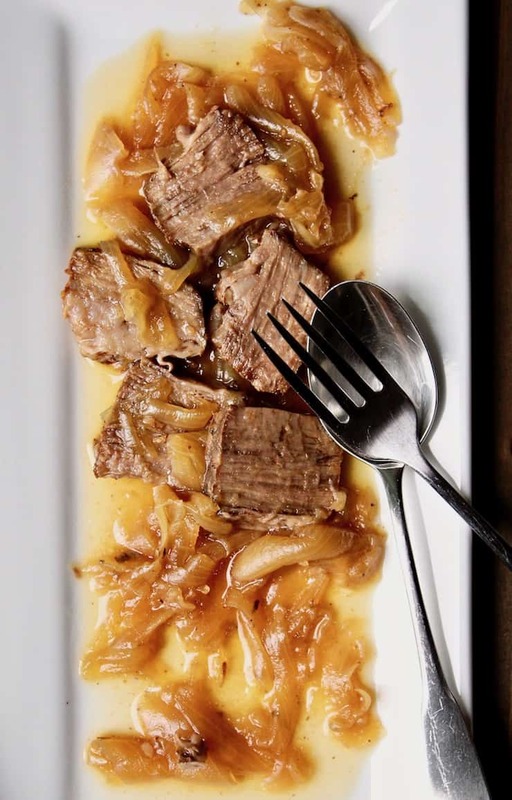 Remove meat from sauce and slice, layer in shallow baking dish and spoon gelled sauce and onions over the sliced meat. Cover tightly with foil and reheat in 325º oven for 45 minutes. *Adapted from Gourmet magazine, February 2009. I miss Gourmet!! simply one of the best meals I’ve ever had… you have to try this before you die. Braised in beer, eaten by wolves.